Aspergillus niger, as an important industrial strain, is widely used in the production of a variety of organic acids and industrial enzymes. To excavate the greater potential of A. niger as a cell factory, the development of highly efficient genome editing techniques is crucial. Here, we developed a modified CRISPR/Cas9 system for A. niger highlighted in two aspects: (1) construction of a single and easy-to-use CRISPR/Cas9 tool plasmid derived from pAN7-1 which is widely used in filamentous fungi; (2) redesign of the easy-to-switch “ribozyme–gRNA–ribozyme (RGR)” element in the tool plasmid. We examined the gene inactivation efficiency without repair fragment and the gene replacement efficiency with repair fragment utilizing the modified system, respectively, and both of them reach the efficiency as high as over 90%. Especially, the co-transformation of the tool plasmid and the specific repair fragment can easily realize one-step knock-out/knock-in of target genes, even with the length of homologous arms as only 100 bp. The establishment of this system will lay a solid foundation for the gene function research and rational design of cell factory in A. niger or broader filamentous fungi hosts. Aspergillus niger, as a member of filamentous fungi, is widely used to produce and secrete a variety of bioactive substance including organic acids, like citric acid (Wang et al. 2017), oxalic acid (Lee et al. 2018), gallic acid (Mata-Gomez et al. 2015) as well as many carbohydrate-active enzyme (CAzymes), such as glucoamylase (Suyama et al. 2017), glucose oxidase (Zhu et al. 2018), and amylase (Varalakshmi et al. 2009), which are valuable in industry especially food industry. And it is generally recognized as safe (GRAS) by the United States Food and Drug Administration. So, A. niger is considered to be one of the most important cell factories for industrial enzymes and organic acids production. Despite the importance of A. niger, the gene function and synthetic biology research have fallen behind because of the dominance of non-homologous DNA end joining (NHEJ) over homology directed repair (HDR) in filamentous fungi (Carvalho et al. 2010; Meyer et al. 2007). In 1990s, deletion of Ku70/Ku80-protein complex was utilized to inactivate the NHEJ pathway, which was reported to strongly reduce the random integration of DNA fragments and lead to high homologous recombination efficiency in filamentous fungi. In A. niger, the deletion of kusA gene which encodes the ortholog of Ku70 protein strongly improved homologous recombination efficiency up to over 80% and did not influence the growth of A. niger (Weld et al. 2006). However, Δku70 was not easy to generate from wild type (WT) strain by traditional ways, and the mutants were further found to be more sensitive to some chemicals such as methyl mesylate, ethyl methane sulfonate and bleomycin (Meyer et al. 2007) so its application is still limited. Recently, the clustered regularly interspaced short palindromic repeats (CRISPR) system has been discovered as an efficient gene editing technology in many organisms, such as plants (Liu et al. 2017; Shan et al. 2013), mice (Shen et al. 2013) and rice (Li et al. 2013). The nuclease Cas9 can cause a double-strand break (DSB) in the target deoxyribonucleic acid (DNA) which is formed by a 20-bp DNA sequence of target gene with a 5′-NGG nucleotide sequence in the subsequent downstream which is called the protospacer-adjacent motif (PAM) (Mei et al. 2016). 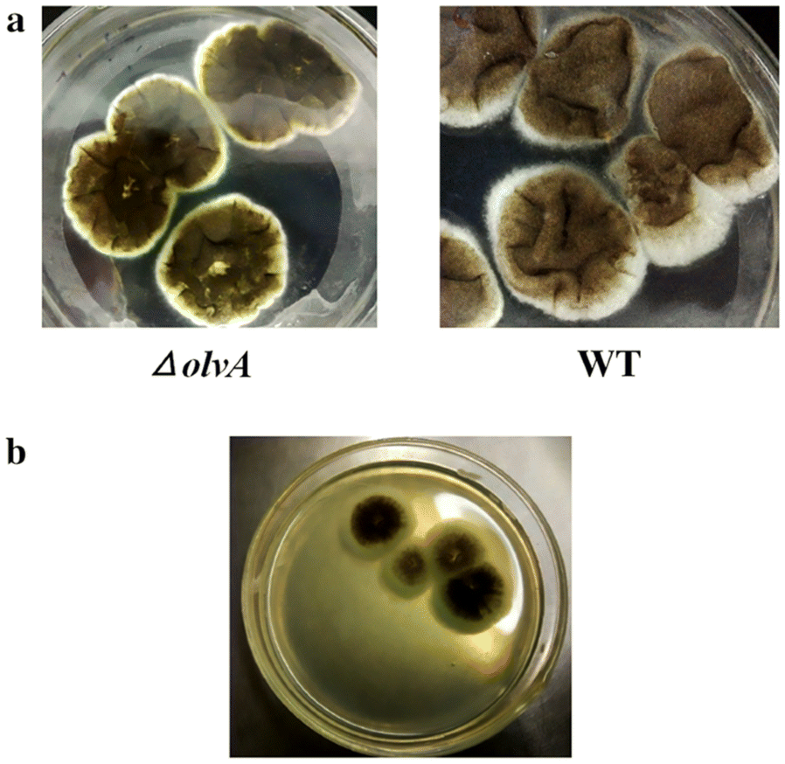 Recently, the CRISPR/Cas9 system has been successfully applied in many filamentous fungi, such as Trichoderma reesei (Liu et al. 2015), Aspergillus oryzae (Katayama et al. 2016), Aspergillus fumigatus (Fuller et al. 2015), Neurospora crassa (Matsu-Ura et al. 2015), and Penicillium chrysogenum (Pohl et al. 2016). What is more, Nødvig et al. (2015) established a versatile CRISPR–Cas9 system with a special ribozyme–gRNA–ribozyme (RGR) structure for filamentous fungi which was benefit from the study in plant (Gao and Zhao 2014) and applied successfully in six different filamentous fungi consisting of A. niger. This structure effectively solved the problem of lacking promoters recognized by RNA polymerase III for the transcription of gRNA in A. niger. But the construction of the CRISPR–Cas9 vector depending on USER cloning or USER fusion (New England Biolabs, USA) raised the cost of the process. And the backbone plasmid pFC330 series in the paper is not common for most researchers. So, techniques based on common plasmid and easy-to-assemble elements still need to be further investigated. In this study, we constructed a CRISPR/Cas9 tool plasmid based on general expression plasmid pAN7-1 for filamentous fungi and designed an RGR element in which the middle gRNA sequence can be easily changed by simple molecular cloning. The efficiency of using it to inactivate a pigment gene of olvA in A. niger was firstly investigated. α-Glucosidase is a by-product of glucoamylase fermentation and its expression will reduce the activity and yield in the glucoamylase fermentation process of A. niger. So, disruption of α-glucosidase coding gene may benefit the production of glucoamylase. We chose one of the α-glucosidase family members agdF as the target gene for disruption because its expression level is the highest in the family during enzyme production process according to our previous transcriptome sequencing data (Lu et al. 2018). 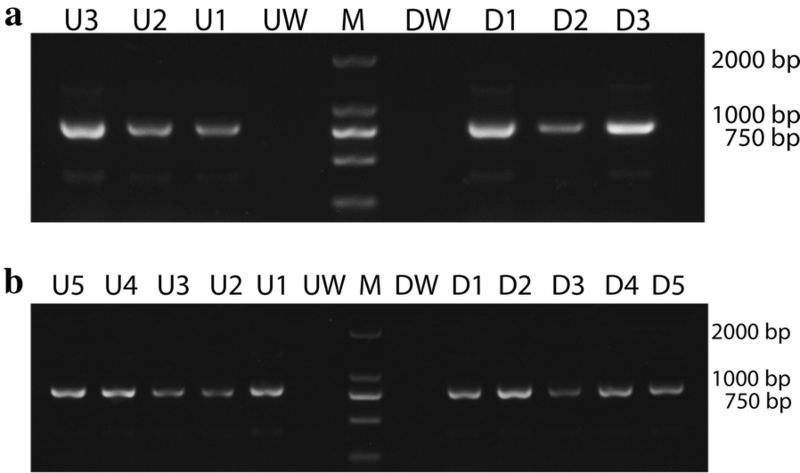 Replacement of agdF by glucoamylase gene using the CRISPR/Cas9 tool plasmid and a repair fragment was further tested. Escherichia coli strain DH5α was used to propagate all plasmids. The glucoamylase production A. niger strain CBS513.88 was preserved in our laboratory and used for genetic manipulation. PDA media (20% potato, 2% glucose, 2% agar) were used for sporulation of A. niger strains. CM medium (0.1% cosamino acids, 0.5% yeast extract, 2% 50% glucose mother liquor, 2% Asp + N, 0.2% 1 M MgSO4, 0.1% trace elements) was used for germination of spore. The transformants were grown on the following double layer medium. The upper media contained 0.95 M sucrose, 0.6% agar, 2% Asp + N, 0.2% 1 M MgSO4, 0.1% trace elements stock solution. The lower media contained 0.95 M sucrose, 1.2% agar, 2% Asp + N, 0.2% 1 M MgSO4, 0.1% trace elements. Asp + N (50 × stock solution): 3.5 M NaNO3, 0.35 M KCl, 0.55 M KH2PO4. Trace elements (1000 × stock solution): per liter, 10 g EDTA, 4.4 g ZnSO4·7H2O, 1.01 g MnCl2·4H2O, 0.32 g CoCl2·6H2O, 0.315 g CuSO4·5H2O, 0.22 g (NH4) 6Mo7O24·4H2O, 1.11 g CaCl2, 1 g FeSO4·7H2O). Fungal spores were inoculated from glycerol stock on PDA culture plates and cultured at 30 °C for 4–5 days for the mycelium growth and spore generation. The fresh spores were eluted with 0.85% NaCl and 0.02% Tween 80. Spore suspension was inoculated into 250 ml liquid CM culture medium at a concentration of 2 × 108/ml for overnight cultivation (16–18 h) at 30 °C, 50 rpm. The germinated spores were harvested by filtering through three layers of miracloth (Millipore, cut and sterilized in advance), washed with SMC solution (1.33 M sorbitol, 50 mM CaCl2, 20 mM MES buffer, pH 5.8) and digested with enzyme solution (200 mg lysing enzyme with 10 ml SMC solution) for 3 h with rotatory shaking at speed of 75 rpm at 30 °C. Protoplast quality and quantity could be checked by microscopy during the digestion process. Before collecting protoplasts, 10 ml STC solution (1.33 M sorbitol, 50 mM CaCl2, 10 mM Tris/HCl, pH 7.5) was added to increase the release of protoplasts. Digested protoplasts were separated from cell wall debris by filtering through three layers of miracloth and the filtrate was precipitated at 3500 rpm for 10 min at 10 °C. The supernatant was discarded and the protoplasts were then washed 1-2 times with 1 ml STC solution at 4500 rpm for 5 min at 10 °C and resuspended in STC solution. The volume of STC solution was set according to the quantity of transformations (100 μl/transformation) and the final concentration of protoplast should be over 7 × 106/ml. Several 50 ml sterile centrifuge tubes were prepared, depending on the number of transformation experiments. For each transformation, 100 μl protoplast suspension, 8–10 μg of plasmid DNA and 25 μl PEG 6000 (25% polyethylene glycol 6000, dissolved at 65 °C in water bath for 10 min) were added to an empty 50 ml centrifuge tube and mixed softly. Subsequently, 1 ml PEG 6000 was added and evenly mixed into the mixture. Then, the tubes were incubated on ice for 5 min. 2 ml additional STC solution was added to the suspension and mixed slightly. Then, 10 ml upper medium containing hygromycin (100 μg/ml) was added into the suspension and mixed uniformly. The mixture was overlaid on the lower medium containing hygromycin (100 μg/ml), and the plates were put at 30 °C for 5–7 days allowing the growth of transformants. The CRISPR/Cas9 expression vector pAN-olvA was constructed as follows. The Cas9 endonuclease from the Streptococcus pyogenes Type II CRISPR/Cas system with a sequence encoding SV40 nuclear localization signal (SV40 NLS) at both 3′ and 5′-end was amplified from the plasmid pX458 (purchased from Addgene) by polymerase chain reaction (PCR) using primers Cas9-F and Cas9-R. The amplified Cas9 was inserted between the gpdA promoter (PgpdA) and trpC terminator (TtrpC) in pAN7-1 (purchased from Addgene) which was an expression plasmid widely used in filamentous fungi, yielding plasmid pANCas9. The pre-sgRNA fragment containing a hammerhead (HH) ribozyme at the 5′-end, the sequence-specific gRNA portion in the middle and a hepatitis delta virus (HDV) ribozyme at the 3′-end was obtained by synthesis (BGI, Shanghai). To facilitate the replacement of different sgRNA element targeting different genes in future, we added two unique endonuclease sites (HindIII and SpeI) at both ends of HH-sgRNA-HDV element by fusion PCR using primers (HindIII-sgRNA-F and sgRNA-SpeI-R). The CRISPR/Cas9 vector was assembled by One-Step Cloning Kit (Vazyme Biotech, China). To inactivate the pigment gene olvA, we constructed the sgRNA-olvA expression cassette. The HH-sgRNA-olvA-HDV fragment was inserted between the PgpdA and TtrpC, forming PgpdA-olvA-TtrpC cassette. The cassette was then cloned into the vector pANCas9, generating the plasmid pANCas9-olvA. As a selection marker, the 2.7-kb hygromycin gene with promoter and terminator from the plasmid pBC-hygro (purchased from Addgene) was amplified by PCR using the primers hyg-F and hyg-R. 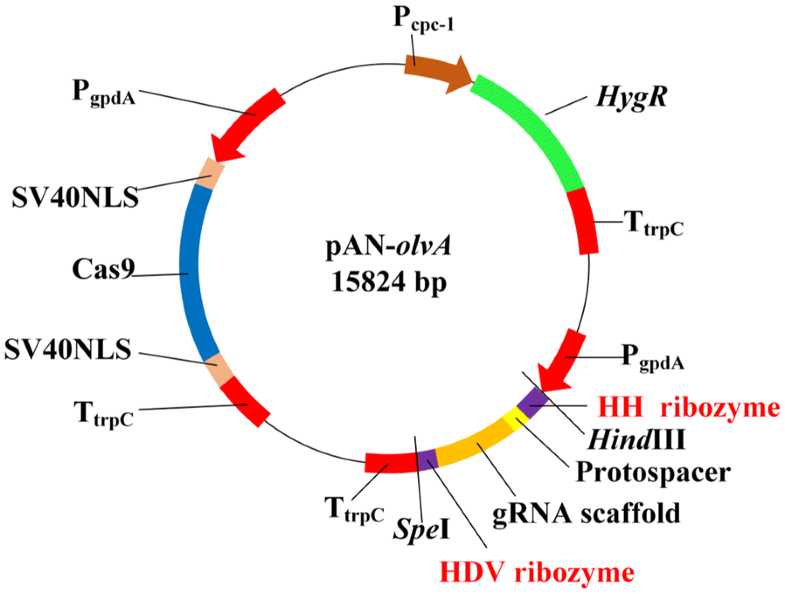 The hyg expression cassette was cloned into the vector pANCas9-olvA, yielding the final plasmid pAN-olvA (Fig. 1) ready for the inactivation of olvA gene. And it was also served as a template plasmid ready for the switch of different sgRNA elements in our further study. To reduce the expression of α-glucosidase and increase the expression of glucoamylase in the same time, we designed the one-step replacement strategy by CRISPR which utilized a plasmid with sgRNA targeting to agdF gene (pAN-agdF), a repair fragment containing over-expression cassette of glucoamylase encoding gene glaA and two 1 kb homologous arms flanking the agdF gene. Because a 6 bp DNA which was the inverted repeat of the 5′-end of the protospacer is necessary to be inserted into the 5′-end of the HH ribozyme region to form special secondary RNA structure for the self-cleavage, the pre-sgRNA element had to be constructed by a two-step PCR. The up and down parts of the insertion DNA were, respectively, amplified by PCR using primers P1 and P2, P3 and P4. The whole pre-sgRNA cassette was obtained by fusion PCR using primers P1 and P4 (Fig. 2). Then by simple digestion and ligation, the HH-olvA-HDV element in pAN-olvA was changed into HH-agdF-HDV, forming the plasmid pAN-agdF. E. coli transformation and plasmid extraction were done according to standard protocols. Primers used for plasmid construction and transformants identification are listed in Table 1. Then, the repair fragment and the plasmid pAN2 (targeting agdF site) was co-transformed into A. niger CBS513.88 by protoplast transformation. After co-transformation, the transformants were firstly screened on medium with hygromycin. To obtain homozygotes, the spores of primary transformants were isolated and spread on the screening medium again. Then, the genome DNA of the single homozygote colony was extracted for the PCR identification (Fig. 3a, b). One of the positive mutants (named as agdF::glaA mutant) identified by PCR was further cultured in shake flasks to examine the enzyme activity of glucoamylase and α-glucosidase. For the contrast, we also measured the enzyme activities of glucoamylase and α-glucosidase of WT strain CBS513.88 at the same time. Gene replacement using homologous arms of reduced length (500 bp and 100 bp) was also performed. To test the feasibility and efficiency of the CRISPR/Cas9 system in A. niger, we choose to target the olvA gene which can be easily screened phenotypically after inactivation. 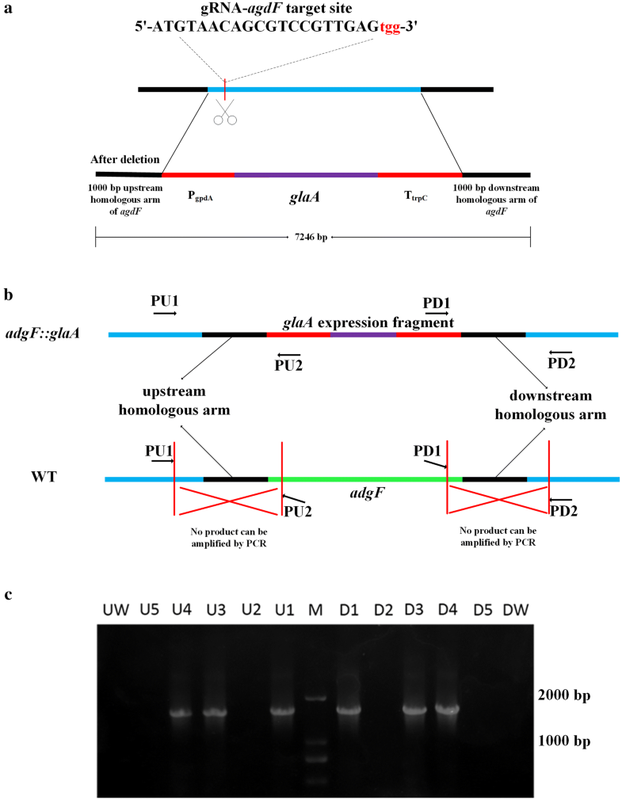 olvA gene encodes the YWA1 hydrolase homolog and its deletion can form olive conidia on regeneration medium while wild strain shows black conidia. A 20 bp of the protospacer sequence with the 3′-PAM AGG for olvA was chosen at the start of the ORF (nucleotide − 18 to − 37). The resulting plasmids pAN1 was transformed into A. niger through protoplast transformation. Most transformants (24/26) grown on hygromycin plates (Fig. 4a) showed the desired phenotype of olive colonies, with the mutational rate of over 90%. Because conidia of A. niger contain two or more nuclei, the isolation of single mutant colony from the original transformants is necessary. We diluted the conidia of primary transformants to 104–105 times and streak the conidia diluent on medium with hygromycin for growth of 3 days to isolate the homozygotes (Fig. 4b). Afterwards, the genome DNA extracted from the single positive colony was used as the template for PCR and DNA identification. The sequencing results reflected either single nucleotide deletion or mutation in upstream of the PAM motif in olvA gene in the two transformants (Table 2). After transformed by plasmid pAN-agdF and repair fragment containing glaA expression cassette and 1 kb arms homologous to agdF, A. niger colonies with hygromycin resistance were obtained. PCR verification of the up and down parts of the insertion (Fig. 3b) in the genome of positive transformants was performed. The result shows (Fig. 3c) three out of five candidates possessing the insertion fragment. One of the three was selected as the agdF::glaA mutant for further enzyme activity assay. As it shows in Fig. 5, the activity of glucoamylase of agdF::glaA mutant was 25.9% higher than wild strain, while the activity of α-glucosidase of agdF::glaA mutant was 61.4% lower than wild strain. To test the relation between the efficiency of gene replacement and the length of the homologous arms, we further designed the repair fragments with 2 sets of different arm lengths (500 and 100 bp) based on the above-mentioned experiment. We co-transformed the plasmid pAN-agdF and the repair fragments with different length of homologous arms. After co-transformation, we selected 3 or 5 transformants from each transformation and extracted their genome DNA for PCR identification. And we found all tested transformants (3/3 and 5/5, respectively) were positive. The results of PCR (Fig. 6) demonstrated that a pair of 100-bp homology arms is sufficient to obtain homologous integration stimulated by the CRISPR/Cas9 system in A. niger with high efficiency. In this study, the CRISPR/Cas9 system showed high efficiency for targeted gene inactivation and replacement in A. niger. Using this system, gene replacement can be introduced by homology arms as short as 100 bp. The results made the technique promising when compared to the reported efficiency of 80% in NHEJ-deficient A. niger using 500 bp homology arms (Meyer et al. 2007). In this study, the Cas9 coding gene was from the Streptococcus pyogenes—without codon optimization, and the Cas9/sgRNA expression vector was derived from pAN7-1 which did not contain the AMA1 element necessary for extrachromosomal replication of a plasmid in filamentous fungi (Carvalho et al. 2010). It was undeniably that the copy numbers of Cas9 and sgRNA could be higher when carried by autonomously replicating plasmid. However, it has been considered that the amount of Cas9 protein and gRNA was not limiting factors for gene editing over many cases. Recently, Zheng et al. (2018) also reported their CRISPR/Cas9 gene editing system derived from pUC plasmid successfully worked in Aspergillus. Although the RNA polymerase III promoters recently have been identified and used for expressing sgRNA in A. niger (Nødvig et al. 2018), RNA II promoters in RGR structure still have advantages. An important one is that some of them are inducible and can be regulated by environmental factors, such as carbon source and pH. This would benefit the expression of the RGR structure in special conditions and then control the function of the gene editing system in some extent. The selection marker for plasmid construction and the length of repair fragment are among other issues that need to be considered when using this in vivo CRISPR system based on plasmid pAN7-1. In our study, there is no phenotype selection marker on the repair fragment, so the conidiophores germinated from primary positive colony on selective medium may have two types: correct mutants or off-targeted mutants in which the hygromycin resistant gene in plasmid integrated into another non-specific site. The two types can be further verified by PCR and DNA sequencing. For direct identification of gene knock-out, one antibiotic resistant gene for the Cas9/sgRNA expression plasmid and another antibiotic resistant gene or an auxotrophic marker gene for the repair fragment are recommended. However, a corresponding nutritional deficient host is needed for the latter condition. In conclusion, we constructed a modified CRISPR/Cas9 system containing specific “RGR” structure and easy-to-switch element for a variety of target genes. The efficiency of the system was tested on the gene disruption of a pigment gene olvA in A. niger, and the mutation rate was up to 93%. In our gene replacement experiments targeting agdF genes for the enhanced expression of glaA gene, 3 secondary transformants out of 5 were confirmed to be the correct genotype and the activity of glucoamylase of agdF::glaA mutant was 25.9% higher than wild strain, while the activity of α-glucosidase of agdF::glaA mutant was 61.4% lower than wild strain. More interestingly, when the homologous arms of the repair fragment were shortened as 100 bp, the apparent recombination frequency is still high. The method may be applicable to more filamentous fungi that are difficult to genetically manipulate, such as Cephalosporium capitis (unpublished data), and so should have wide applications in genome editing of filamentous fungi. YZ performed the experiments, analyzed data, and wrote the draft; LO designed the experiments and wrote the paper; YN and JC were involved in writing the manuscript. All authors read and approved the final manuscript. All materials are available in our lab. This work was financially supported by 2015 Open Project Fund of the State Key Laboratory of Bioreactor Engineering.